Well it doesn’t seem like a week since I was writing the one for last week, the weather that effects us gardeners more than others, ended up being pretty wet but so warm this week thankfully drying out a little towards the end of the week, with that strange yellow thing in the sky appearing for one day. The rumour is Jack Frost could be arriving this week, I wonder how tough he will be, need to get the rest of my tender plants in overcome this weekend, hopefully to save them for next years enjoyment. Anyway here are this weeks 6 highlights from my own and my clients gardens. This lovely hydrangea has decided it’s time to flower again for some reason, seems a common occurrence amongst hydrangeas this year, never mind, we get to enjoy their beautiful flowers for a little longer! 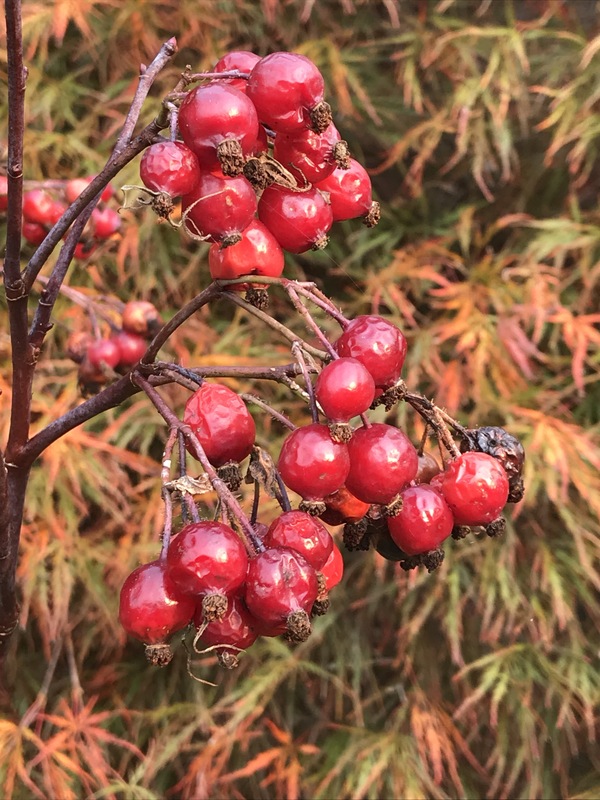 Time for some hips and Rosa glauca is having one last throw of the delight dice, after thrilling is all summer with its grey foliage and small but perfectly formed pink flowers, it finishes the season with some great hips and I love great hips! Spiders spiders everywhere! Wherever you look at this time of year the evidence of spiders can be found in hedges, grass and borders. Their cobwebs are like natures own deadly decorations bringing in winter, really luck to get this one after a heavy mist the other day! Previous post: Wild about gardening week- a time to look at the basics of life in our garden? That acer looks fabulous. I’ve had two over the years, killed them both. While you had that strange yellow thing appear in the sky, we had a strange profusion of drops of water falling from the sky! It was SO strange! It was like water for free! a lovely, lovely six this time. And your photos so wonderfully grab the lusciousness of it all. I wish we had some of that rain! all my plants (and my skin) are looking parched..
I’ve got one of those acers. Half of it went straight from purple to bare; the other half is still purpleish with brown edges. Doesn’t look like I’ll see an autumn performance this year. Brian seems to have done for my garden spiders. All the webs blew away last weekend and I haven’t seen one since, just the odd string stretched somewhere as a sign that the spider couldn’t be bothered or fell victim to a passing bird. Finding six is proving hard today. May need to book a day return to Dubai! Lol yes Dubai sounds nice doesn’t, shame about the acers they are just so beautiful when they turn, did you get much damage rom Brian? The stinking iris really is lovely. Might have to keep an eye open for that one, if it will tolerate some summer heat. I wonder if it is related to Iris domestica which also has seed pods that open to expose berry-like seed. You WERE lucky to get that spiderweb photo. Lovely! And the leaf piles remind me of all the raking I still need to do. Lovely photos again, I particularly the rose hips. Didn’t naughty children used to make itching powder from them? Those look good enough to eat! Some amazing photos this week Thomas, great stuff. Love the acer, and those rose hips. This was lovely to read and the acer looks marvellous. I didn’t get round to doing the Six blog this week but hopefully will do one in a while.